Having been crowned the ‘World’s Leading Tourist Attraction’ at the prestigious World Travel Awards in the Maldives, Titanic Belfast in partnership with Q Radio want to say THANK YOU for all the local support in 2016. They are giving away complimentary tickets for local residents to the Titanic Experience on the 8th January 2017 for NI Citizens Day! With over 1 million votes cast from over 216 countries in the awards, known as the ‘Tourism Oscars’, we recognise the key role Northern Ireland locals had to play in making Titanic Belfast ‘King of the World’. 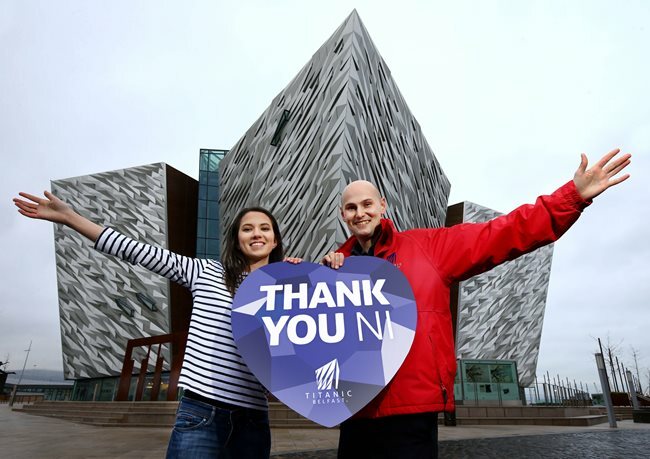 To say thank you, Titanic Belfast are releasing a number of online tickets, free-of-charge, for locals at 12 noon on Wednesday 4th and Thursday 5th January 2017, providing the opportunity for NI residents to visit or re-visit the world-class landmark right on their doorstep. For the chance to get your hands on one of these limited one-off golden tickets to beat the January blues and experience the World’s Leading Tourist Attraction, simply book your tickets online here using promo code TBTHANKSNI. Free-of-charge tickets will be released at 12 noon on Wednesday 4th January with a second release at 12 noon on Thursday 5th January.